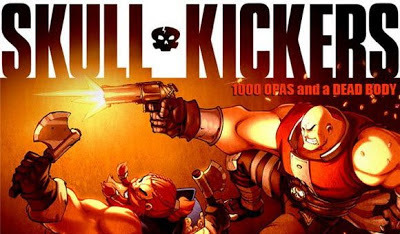 Skullkickers is a sword & sorcery action comic with American Manga hybrid art in the vein of Ed McGuinness or Joe Madureira (its highly possible that Joe Mad’s own fantasy-themed book Battle Chasers was a huge influence.) The book follows two mercenaries, one of which is a stocky dwarf, on their quest for “money, fame and adventure.” Their travels has them crossing paths with zombies, goblins, werewolves and plant people with violent and often comedic outcomes to those encounters for the two un-named ‘heroes’ of the comic. This is sure to appeal to fans of Dungeons and Dragons and Lord of the Rings, especially those who like a little humor in their stories. Skullkickers is written by Jim Zub with art by Edwin Huang, Chris Stevens and Misty Coats.